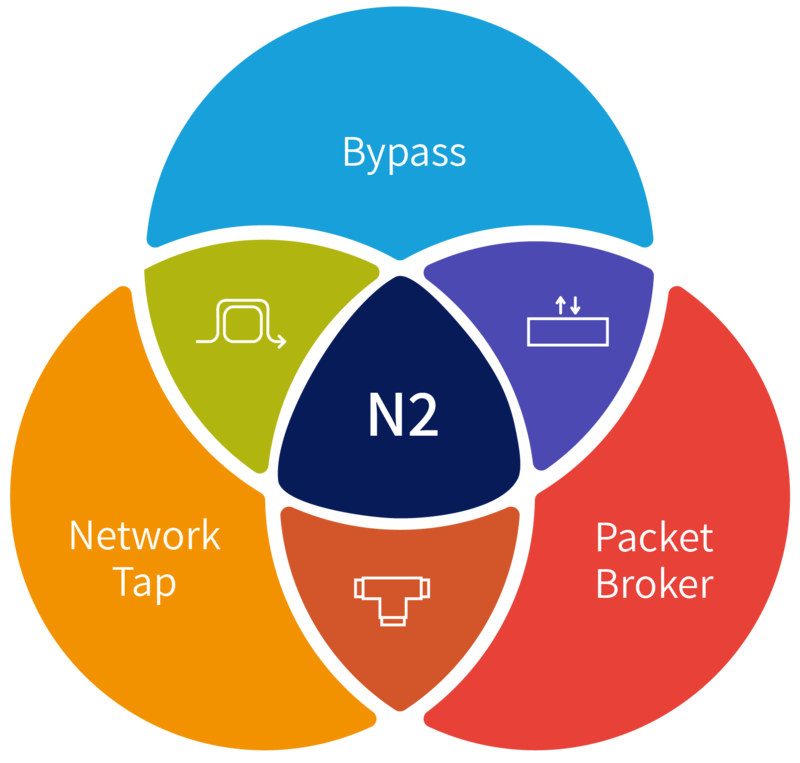 The N2 modular network packet broker product series provides a single multi-purpose platform that covers all the visibility adaptation scenarios in a network. The N2 series can be populated with a wide range of high-density, high-versatility, processor-accelerated modules. This modular design supports advanced FabricFlow technology. It supports capabilities and features including network tap, bypass, packet broker and packet processing applications. integrated passive tap module: Consists of integrated passive taps (copper or fiber). The module includes integrated passive splitters where users can specify the network/monitor split ratio to satisfy their deployment needs. Also includes integrated transceiver on all ports, bringing the traffic to the non-blocking switching fabric backplane for use by any of the other modules. Users can attach as many monitoring appliances as required by combining an iPassive module with an iBroker module. integrated bypass module: Consists of bypass segment(s) of 2 network ports and 2 appliance ports. Double-protection bypass technology offers a built-in failsafe optical or copper relay on network ports and user-configurable heartbeat-generated packets on the appliance ports, so that appliance failure can be automatically detected. The module also includes integrated transceivers on all network ports, bringing the traffic to the non-blocking switching fabric backplane for use by any of the other modules. integrated network packet broker module: Consists of input/output ports that are connected to the non-blocking switching fabric backplane. By connecting to the backplane, the input ports that serve the network side can be used by any of the other modules. The output ports that serve the tool/appliance side can be connected in monitor or inline deployments. Each 1U row supports four hot-swappable bays, each designated as single-width bay. The 1U 2845 features 1 row with a total of 4 bays and the 2U 2847 features 2 rows for a total of 8 bays. Modules come in single-width bay size and double-width bay size. A user can dynamically hot-swap different bay-width modules to mix and match module functionality and module bay width size according to their needs. The double width bay module can dynamically fit into the space of any two adjacent 1 width bay locations. inPassive for 100BaseFX Fiber Supports 4 network links. Integrated passive splitters. Integrated transceivers on all network ports, bring traffic to the non-blocking switching fabric backplane for use by any of the other modules. 8 ports, 4 port pairs. Each pair can be individually configured to function as either a tap, a bypass or a packet broker. Any combination of modes is possible. 24 ports, 12 port pairs. Each pair can be individually configured to function as either a tap, a bypass or a packet broker. Any combination of modes is possible. Module occupies double bay. Supports 2 full bypass segments, each with 2 network ports and 2 appliance ports. Integrated dual rate (1/10Gb) transceivers, on all network ports, bring traffic to the non-blocking switching fabric backplane for use by any of the other modules. Supports 1 bypass network link and 2 network ports. Integrated 40Gb or 100Gb transceivers, on all network ports, bring traffic to the non-blocking switching fabric backplane for use by any of the other modules. Appliance port should be connected by the use of a separate module. Supports 4 network links and integrated passive splitters. Integrated dual rate transceivers, on all network ports, bring traffic to the non-blocking switching fabric backplane for use by any of the other modules. Supports 1 network link. Integrated passive splitters. Integrated transceivers on all network ports, bring traffic to the non-blocking switching fabric backplane for use by any of the other module. Supports 8 Network I/O ports. Ports are connected to the non-blocking switching fabric backplane for use by any of the other modules. Supports 4 network I/O ports. Ports are connected to the non-blocking switching fabric backplane for use by any of the other modules. Supports 1 network I/O port. Port is connected to the non-blocking switching fabric backplane for use by any of the other modules. Supports 1 bypass network link and 2 network ports. Integrated 40Gb transceivers, on network ports, bring traffic to the non-blocking switching fabric backplane for use by any of the other modules. Supports 2 network links and integrated passive splitters. Integrated transceivers on network ports, ring traffic to the non-blocking switching fabric backplane for use by any of the other modules. Bypass and packer broker combo. Supports 1 100Gb bypass network link (2 network ports). In addition, 8 x 1/10Gb I/O ports. Integrated 100Gb transceivers on network ports, bring traffic to the non-blocking switching fabric backplane for use by any of the other modules.